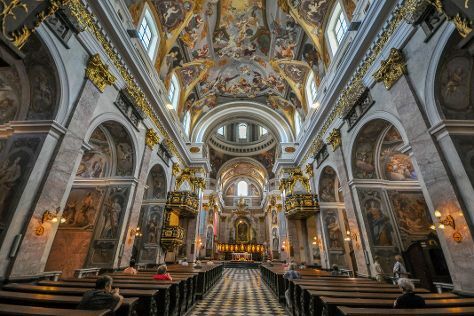 Your inner history buff will appreciate Cathedral of St. Nicholas and Radovljica Old Town. Escape the urban bustle at Zipline and River Rafting & Tubing. Explore the numerous day-trip ideas around Ljubljana: Piran (Church of St. George, Scuba & Snorkeling, & more), Royal Golf Bled (in Lesce) and Kobarid (Kobariški muzej d.o.o., Kozjak Waterfalls, & more). Spend the 8th (Tue) exploring at Lake Bled. Spend the 19th (Sat) exploring nature at Mostnica Gorge. There's much more to do: kick back and relax at Portoroz Beach, admire the sheer force of Waterfall Savica, explore the striking landscape of Triglav National Park, and pause for some serene contemplation at Koper Cathedral and Bell Tower. For other places to visit, reviews, photos, and tourist information, use the Ljubljana travel itinerary creator. If you are flying in from United States, the closest major airport is Ljubljana Jože Pučnik Airport. In July, daytime highs in Ljubljana are 80°F, while nighttime lows are 56°F. Finish your sightseeing early on the 22nd (Tue) to allow enough time to travel back home.